The KRB Magnabend 111 is a servo-controlled double bender with a 957mm center distance. 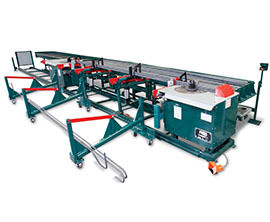 This allows fabricators to move more of their work from a table bender and reduces 2 and 3 man bending. The MagnaBend 111 has user-friendly controls that are easy to operate, faster to set-up and reduces operator errors. The built-in tooling storage tray allows tooling to be stowed conveniently and safely. The short stationary bend box facilitates more ergonomic loading.